The Epiphone AJ-210CE Outfit comes factory fitted with Shadow Performer Tuner Preamp and NanoFlex under saddle pickup system and has a more ergonomically friendly body design. This guitar is a great choice for just about any performer. This is a classic and perfectly put together dreadnought with a select spruce top and classic cutaway design. Dreadnoughts are generally pretty well known for their commanding volume and power and full tone, and the AJ-210CE solidly fits this mould. It's ideal the singer-songwriter (or someone working in a duo) that needs an acoustic to give them some acoustic volume. The select spruce top is paired with a body and neck which are cut from select mahogany, a tone wood known for its tonal warmth and colour. The AJ-210CE has Epiphone's classic SlimTaper neck - anchored in with a classic dovetail joint - with a “D” profile. The “reverse belly” bridge and Epiphone-styled, imitation tortoise pickguard with a metal "E" logo round out the vintage styled package. Whether you're getting ready to record in the studio or about to show off your musical creations on stage, the AJ-210CE is equipped to handle all your needs thanks to onboard Shadow Performer Tuner Preamp and Shadow NanoFlex under saddle pickup system. Either way, play with confidence knowing that Shadow is a world leader in acoustic guitar electronics and this preamp/pickup combination ensures you'll hear the true sound of your guitar wherever you are. 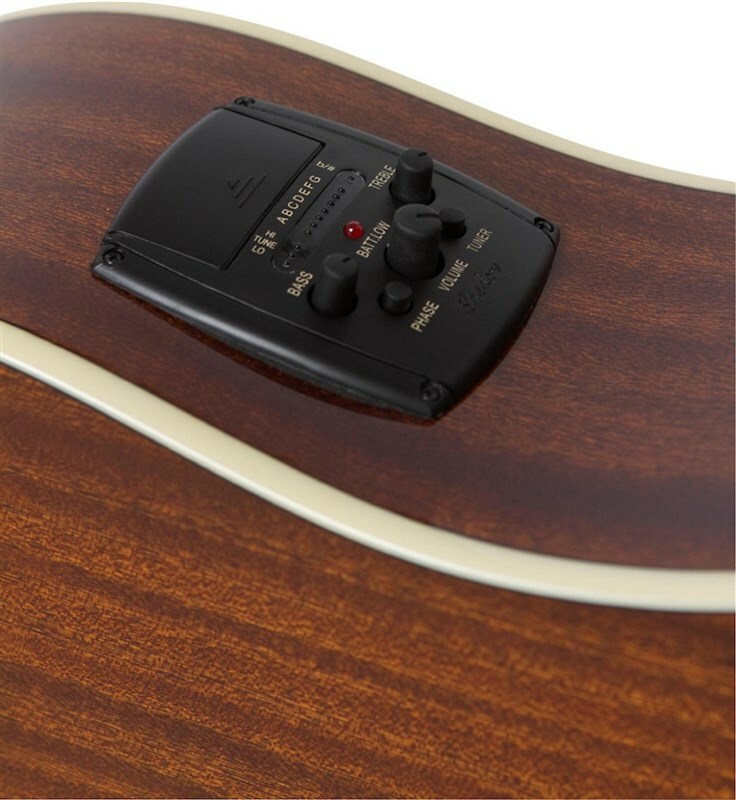 Shadow's Performer Tuner preamp features all the controls needed to shape the tone of your AJ-210CE to suit your playing style or venue size, including a 2-band EQ, master volume control and built-in chromatic tuner. There's also a phase switch to eliminate any unwanted, untimely feedback, and a handy tuner/mute button that lets you plug in or unplug you cord without worry of those loud, ear-cracking pops. The Performer Tuner preamp uses two 2032 lithium watch batteries which are much lighter and last a lot longer than more traditional 9-volt battery-using preamps.